Group tours - 10 people or more; mini groups - 4 to 8 people; and FIT's* - minimum 2 people. Quoted prices are for group tours; contact us for details. 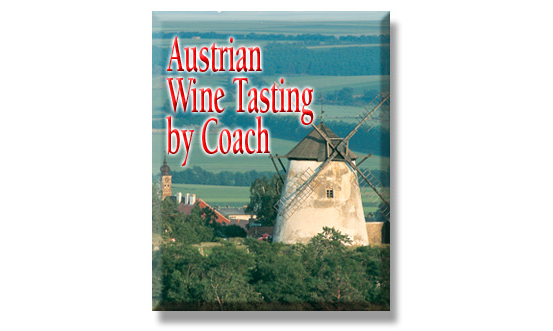 "If you have never tasted Austrian wines, now's the time to try them on this "tour of tastes". 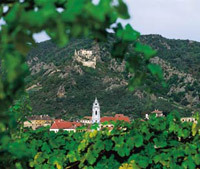 This unique tour will give the traveler a chance to taste wines from several wine regions of Austria such as the Danube River Valley (Wachau) and the Kamp River Valley; the hills surrounding Vienna in the South; Vienna itself (the only capital in Europe that has vineyards within its city limits and wonderful wines!!) and the Burgenland (most Eastern province). 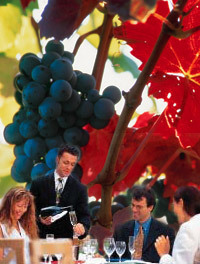 You will be tasting whites and reds – Insider Tip: Grüner Veltliner, only grown in the Eastern Austrian wine regions; and Zweigelt, a unique red wine coming from the Burgenland. As true foodies we at Herzerl Tours are convinced that the regional cuisines add a lot to the taste and the "nose" of the different wines. TOUR DATES: best times are May and October, other dates can be arranged. This tour is being offered as a wine tasting tour visiting vintners in Vienna itself, then east of Vienna in the province Burgenland; and then Northwest of Vienna in the Wachau valley. AM-Arrival at Vienna airport, transfer to four star Hotel in private minivan/coach (minivan with driverguide, coach with assistant) Porterage at airport included. PM-2 hours walking tour with English speaking guide in downtown area. EVE-Early dinner at Restaurant Griechenbeisl. AM-Free at leisure-Lunch on own. 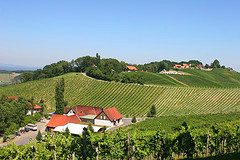 PM-Half day excursion to the wine growing area of the Northern Vienna Woods. (Nussberg) with a stop for wine tasting by (minivan/coach) with English speaking guide. EVE-Dinner and winetasting at wine tavern (Heuriger) Wieninger in Stammersdorf. Buffet breakfast at hotel and checkout. AM-Pick up from hotel for full day excursion to Rust, Burgenland, with and on to Eisenstadt. Lunch on own-Then wine tasting at Weinakademie Rust or winery Tremmel. AM-Guided visit of Esterhazy Palace. 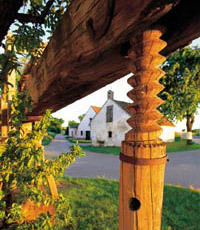 PM-Minivan/coach for half day excursion incl boat ride on Lake Neusiedl and stop in Jois – winery Kiss for wine tasting. EVE-Wine tasting at Leisserhof in Donnerskirchen with vinologist Engel. Afterwards dinner in the adjacent gourmet restaurant. Return to hotel in Eisenstadt. Buffet breakfast at hotel and check out. depart Franz Josef train station for Krems on the Danube transfer to four star hotel and check-in. PM-Excursion to Dürnstein with coach and English speaking guide. Noon wine tasting at the vinery of the Freien Weingärtner Dürnstein -Wachau. Lunch on own-Optional visit Dürnstein castle and Baroque church. PM-Boat trip on the Danube from Dürnstein back to Krems and hotel. EVE-Gourmet dinner at the leading Austrian chef’s Mörwald’s Restaurant “Kloster Und”. 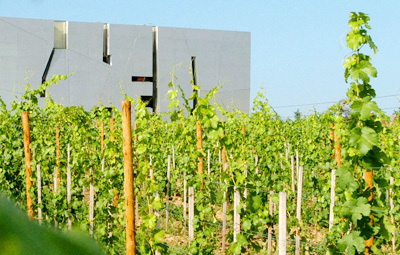 The architecture and vineyard at Loisium Wine Museum. AM-Excursion with coach and English speaking guide to Langenlois, visit the Wine Museum Loisium. Lunch on own. Afterwards join a local vintner for wine tasting. return to Krems by coach. EVE-Dinner at the Steigenberger Hotel.gourmet restaurant. AM-Excursion with coach and guide to Baroque Göttweig Abbey. Guided visit of Abbey. Lunch and winetasting the very old and traditional bio vintner Nikolaihof. Afterwards return to hotel - from Mautern to Krems by coach. Very early breakfast at hotel. AM-Early train to Vienna and transfer to Vienna airport for flight back to USA. Accommodation with buffet breakfast in four star hotels; meals in top restaurants and wine tastings at well known vintners, experienced guides for all excursions, use of mini van or coaches depending, taxes and entrances. The Vienna & Burgenland segment costs $1,775.00 for four overnights; the Vienna & Wachau segment costs $2,275.00 for five overnights, each per person, land only. These segments lend themselves wonderfully as an add-on to other trips. All tour prices are based on the current exchange rate of the Euro vs. the Dollar (Jan 2011) i.e. any cost increases caused by a weakening dollar shall have to be passed along to client. PLEASE NOTE THAT BOTH TOUR PRICE AND PROGRAM ARE SUBJECT TO CHANGE IF NECESSARY. Herzerl Tours also recommends you visit these sites while you are "CYBERTOURING"